What is it with these anti-fluoride campaigners – and particularly their leaders? They make a song and dance about having “science on their side.” They will heavily promote the latest research and papers if they can argue that they confirm their bias. And they will email politicians or make submissions to local bodies making scientific claims – often with citations and long lists of references. But we simply can not get them to enter into a good faith scientific discussion of the sort I suggested in Do we need a new fluoride debate? 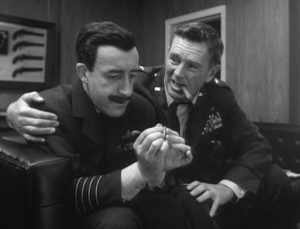 Characters debate the “fluoride conspiracy” in Kubrick’s Dr Strangelove. I thought this was going to happen. Bill Osmunson, the current Director of the Fluoride Action Network (FAN), had agreed and even produced an initial article for posting. But he has now pulled out and asked me not to post his article. Apparently, my critique of a recent paper by him and his colleagues from FAN (see Flaw and porkie in anti-fluoride report claiming a flaw in Canadian study) was the straw that broke the camels back as far as he was concerned. Talk about tiptoeing around a discussion partner. How can one have a discussion with someone this sensitive? “I have second thoughts about a discussion with you. Do not publish my comments*. After reading your comments in response to Neurath, it became obvious that you have no interest in discovering the truth or protecting the public. Nor do you have reasonable judgment to evaluate research. You do have good mechanical skills, but not judgment. You correctly take weaker arguments and point out they are weak. But you do not comment or appreciate the main more powerful issues. Your comments make it sound like there is no value because some points have lower value. Only a person who carefully rereads McLaren and Neurath, and then your comments understands some of your points are valid and you have missed others which are powerful. In addition, you use derogatory, unprofessional mocking terms to attack the person instead of the issues. I’m not interested in being your porky or sparky or pimp. *The “comments” Bill refers to are a 55-page pdf file he sent me as the first post in our exchange. We were discussing a shorter form more suitable for a blog post when he decided to back out. “Several people have told me not to respond to you, because you are unprofessional with your statements and comments. You attack the messenger instead of the message and you have such severe bias and faith in fluoride that you must have worked for the tobacco companies to learn your strident blind bias. Bill Osmunson and his mates claim I behaved badly in this exchange with Paul Connett – but they refuse to give a single example. Sounds like “excuses, excuses,” to me. Surely I am not such a horrible person? I asked Bill to identify anything in my exchange with Paul Connett (see The Fluoride Debate) where I had behaved in the way he charged. He couldn’t. And I challenge anyone else to identify such behaviour on my part in that exchange. I can only conclude that the people at FAN are unable to provide good scientific arguments to support their case. They may well produce documents with lists of citations and references with “sciency” sounding claims. But they will not allow their claims to undergo the sort of critique normal in the scientific community. Still – I am willing to be proven wrong. if Bill feels that he doesn;t have the scientific background for this sort of exchange perhaps Chris Neurath, Harvey Limeback or one of the other authors from FAN of the article I critiqued in Flaw and porkie in anti-fluoride report claiming a flaw in Canadian study) could take his place. Yours mirrors my own experience of trying to get the anti- 1080 lobby to engage for my book. Ringleaders issued directives over Facebook, telling people to decline interviews. It spoke volumes… I’m often struck by the close similarity in behaviours and tactics displayed by science deniers across many different issues. Maybe that shouldn’t surprise me – the same names often appear in them all.